Khajjiar ,most beautiful place in Chamba, Himachal Pradesh. Khajjiar is located at a height of about 2000 m.
Khajjiar is also known as Mini-Switzerland of Himachal Pradesh. Khajjiar is located in Chamba district of Himachal pradesh. Dhauladhar ranges and Himalayan peaks can be seen from far. There is a reason of second name of khajjiar as Mini-Switzerland, i.e. Due to beautifulness of khajjiar and topological resemblance to Switzerland, in 1972 Mr. Tilly V Blazer ,Head of Chancery of Switzerland called khajjiar as Mini-Switzerland. After that tourism in khajjiar reached at new heights. 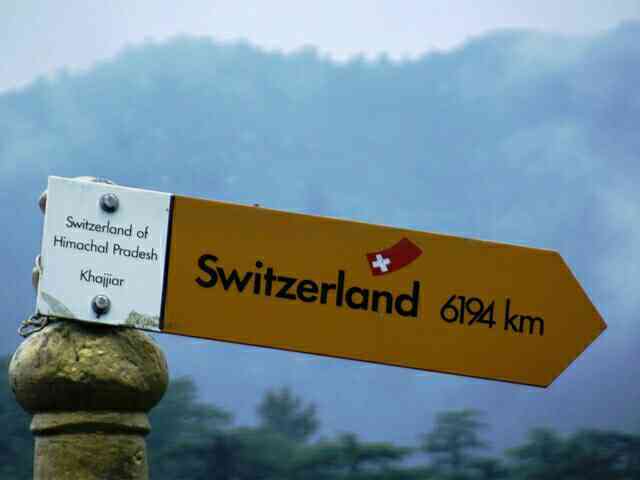 He also put a sign board of yellow color which shows distance of khajjiar from Switzerland. Khajjiar is one of 160 places which resembles to Switzerland. 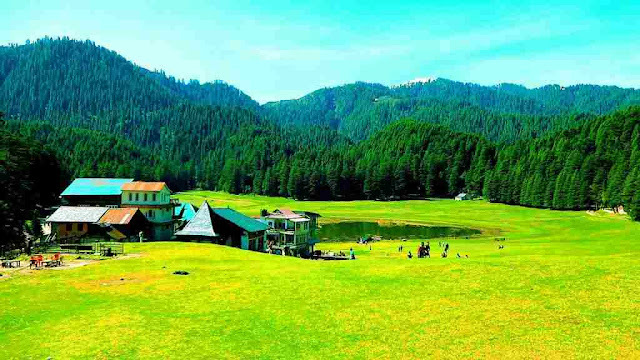 Khajjiar or Mini-Switzerland is located at a height of 6500 feet from sea level. Khajjiar is located at a distance of around 569 km from National capital Delhi, and 24 km from other beautiful place Dalhousie. There are so many places to travel in khajjiar , Mini-Switzerland. Chamba , Dalhousie and bharmaur are some of the best tourist places in Khajjiar. Golden Devi temple in khajjiar is located at the edge of the khajjiar lake and due to its golden dome, it is known as golden Devi temple. This temple is one of the famous tourist attraction and famous temple of khajjiar. Several animals like leopard, lion, tiger ,deer , jackals etc can be seen in sanctuary. Some endangered species of animals can be seen here. Khajjiar villages is famous for apple gardens and long trees near villages. Khajjiar villages is near khajjiar ground. There is one tree which is famous for its shoots and so called as Paanch Pandav trees. There are 6 shoots of similar length in a single tree and local people of khajjiar called, it represents five Pandva's and Draupadi. Khajji Nag Temple was built in 12 AD, and one of the holy place to visit in khajjiar. There is Mandapa inside this holiest temple and khajji Nag Temple is near khajjiar lake. There can be only word for khajjiar lake and ground that is 'heaven'. It is really treat for eyes to watch these lake and ground. Shahrukh starter movie 'kuch kuch hota hai' was filmed in this place. Khajjiar lake is at a distance of 20 km from Dalhousie and cover an area of around 5000 sq yards. Tourist who come here can enjoy trekking in khajjiar. Khajjiar to dainkund is moderate 3km trek. - Several guest houses and cottages of PWD and forest department. 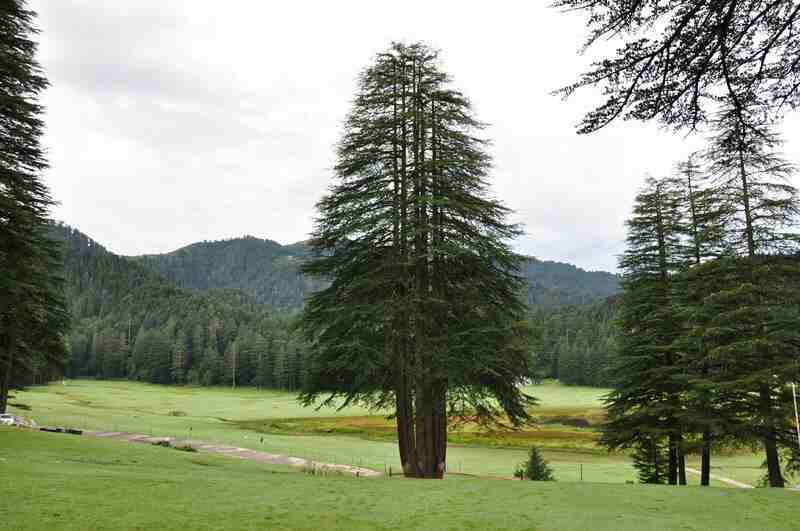 In khajjiar temperature is very attractive for tourists and it is cool in most of time. Tourist can visit this holiest place during month of march to November. It is 23 km from Dalhousie and around 26 km from Chamba district.